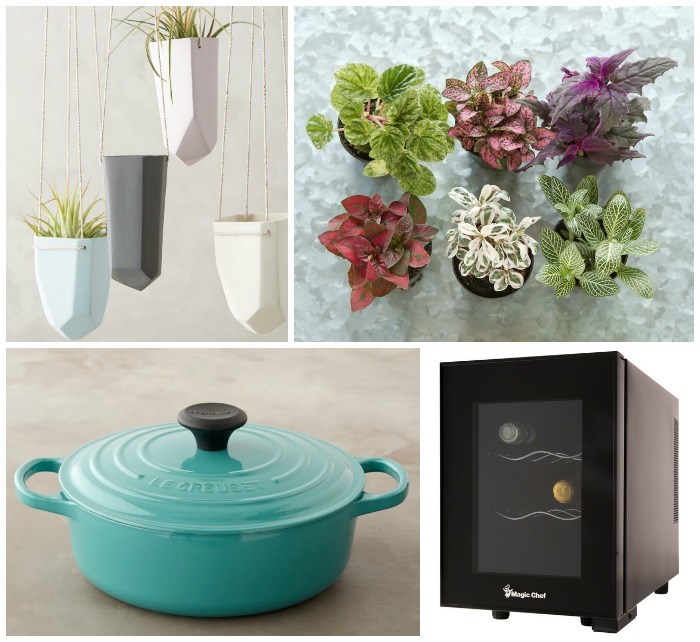 We’ve been having some fun brainstorming gift ideas we love, and think you might just love too, for Mother’s Day this year. 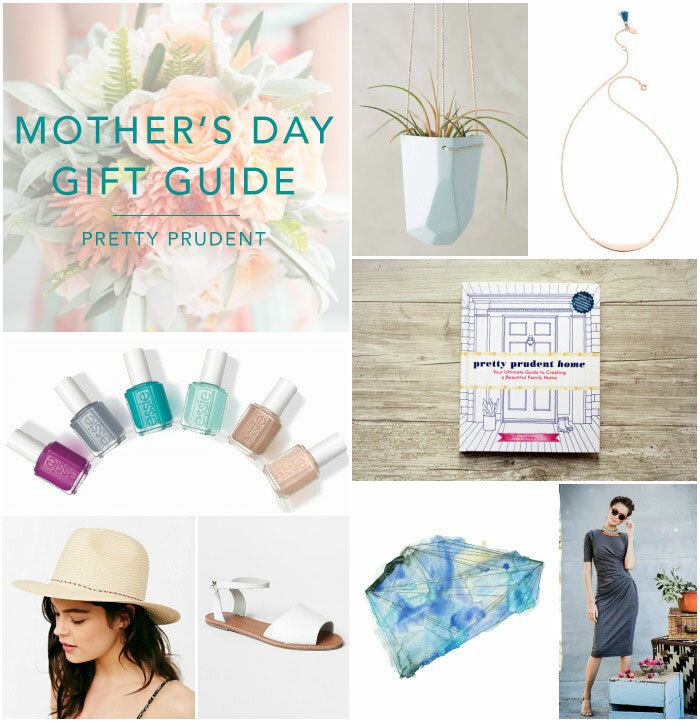 There’s a little something for every type of mama, whether she loves to read, garden, cook, craft, create, or just take a nap. See what Jaime and Jacinda have at the top of their lists this year, and share your top gift ideas in the comments below. Our first book, Pretty Prudent Home: Your Ultimate Guide to Creating a Beautiful Family Home, has hit the shelves! Pick up a copy just in time for Mother’s Day to see our design tips, practical life advice, and a large dose of whimsy. It’s the everything-you-need-to-know guide for creating lasting memories with your family at home. Design Mom: How to Live with Kids: A Room-by-Room Guide – Designing a beautiful home with kids can be challenging. Gabrielle Stanley Blair’s new book guides you through the process for creating a beautiful, functional, and creative space the entire family can enjoy. Oh Joy! 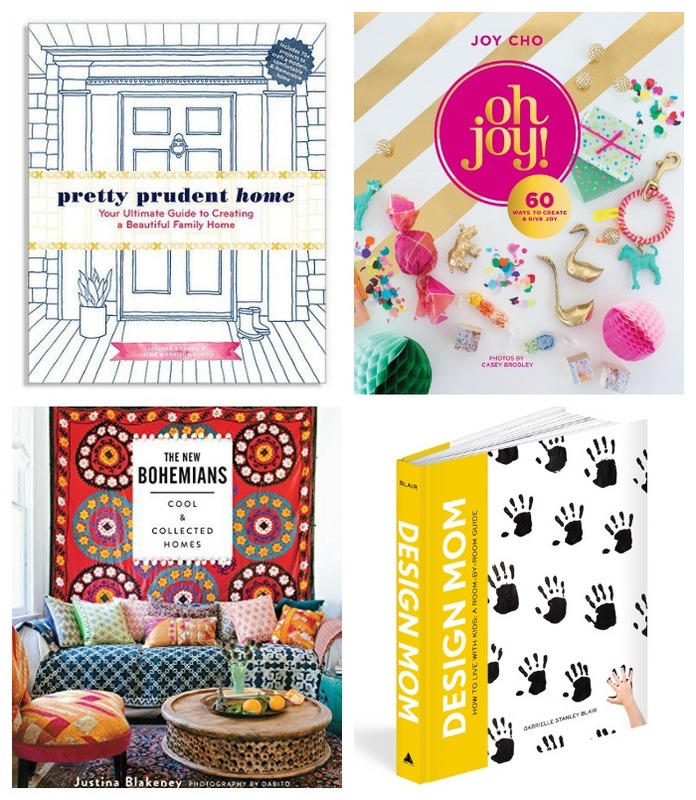 : 60 Ways to Create & Give Joy – Whether it’s fashion, decor, entertaining, food or gifts, Joy Cho, shows you how to bring a pop of color and a burst of creativity to all aspects of your life. The New Bohemians: Cool and Collected Homes – Designer, Justina Blakeney‘s new book is filled with inspiration for how to bring the new bohemian trend into your home. Through decor inspiration and creative projects, she will encourage you to break the rules, step out of your comfort zone, and embrace this beautiful, cool and collected aesthetic. This cute straw hat from Urban Outfitters is a great accessory for her to wear through the spring and all summer long. How pretty are the colors in this striped towel from Zara. You can’t go wrong with the Classic leather sandal from Gap this season. It also comes in brown and black. 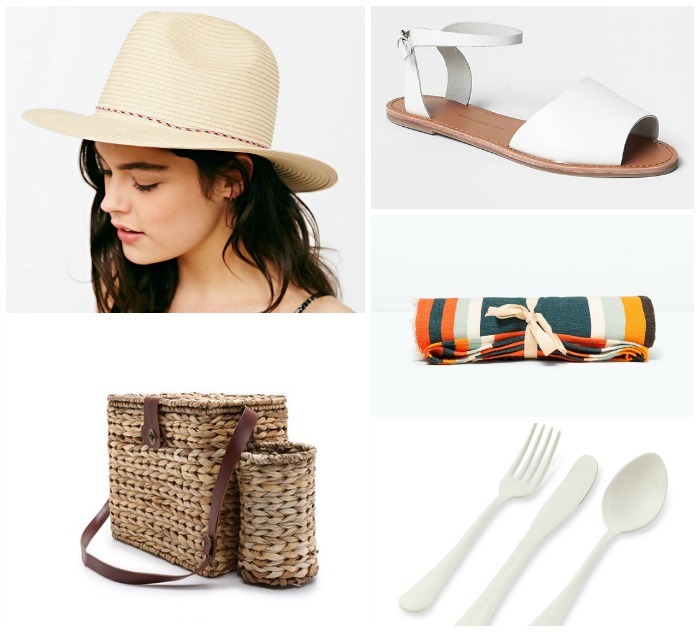 Fill this Shopbop Picnic Basket with plenty of drinks and treats. White Enamel Flatware from Williams Sonoma is popping up on picnic tables everywhere this year. Pick up a set to add to her basket. The hand-selected Terrarium Plant Collection from Terrain is created to be the perfect blend of colors and shapes for eye-catching terrariums. We love the Magic Chef Wine Cooler because of its size and convenience. Choose a small one that fits right on the counter top, or a larger one that can fit both wine and other beverages. Adjust the temperature to your liking and enjoy. This handmade hanging planter from Anthropologie comes in a variety of different cuts and colors. Their unique shape is inspired by natural crystals and gems. If she loves to cook, surprise her with this pretty turquoise La Creuset Dutch Oven from Williams Sonoma. 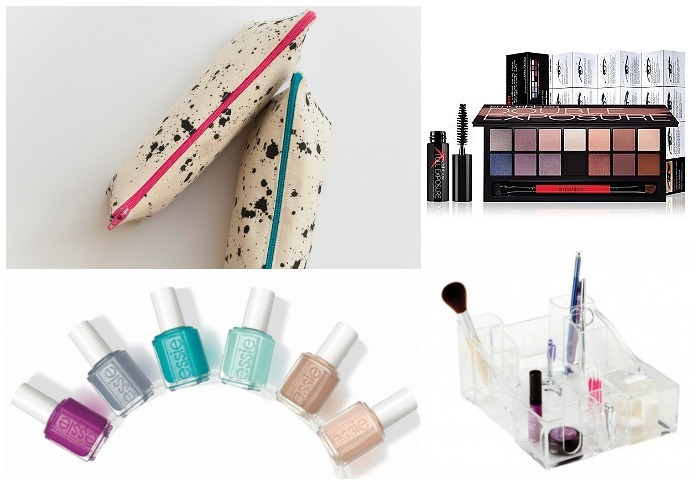 Anna Joyce’s ink splatter zipper bags can help make storing cosmetics or accessories a whole lot easier during summer vacation. I envy Jaime’s organization, especially all her perfectly stowed away makeup and hair accessories in her crystal clear caboodle. Add to her makeup collection with the Smashbox Palette. It contains colors for both day and night, natural and dramatic looks. Essie Spring Nail Colors are out and we are falling for them all. Fill her walls with art from Minted, we have our eyes set on the Texas Gold Foil Map and Gemstone Prints. A portion of the art sales will go to the non-profit organization, Every Mother Counts, which works with mother’s worldwide to help make pregnancy and childbirth safe for every mother. We are huge fan of Kelly Christine’s photography, and would love one of her prints in our home. Jacinda is currently crushing on her Double Rainbow Over Marfa print show above. Go for the gold with the Double Knotshine ring from Madewell. Give her a chic pair of Park Avenue Sunglasses from Urban Outfitters. The hooded Dip Dye Poncho is a versatile garment that can be used for a little extra warmth on spring evenings, and as a summer wrap for the beach. Light the Gold Dice Candle to enjoy the fragrant three-layered scents. 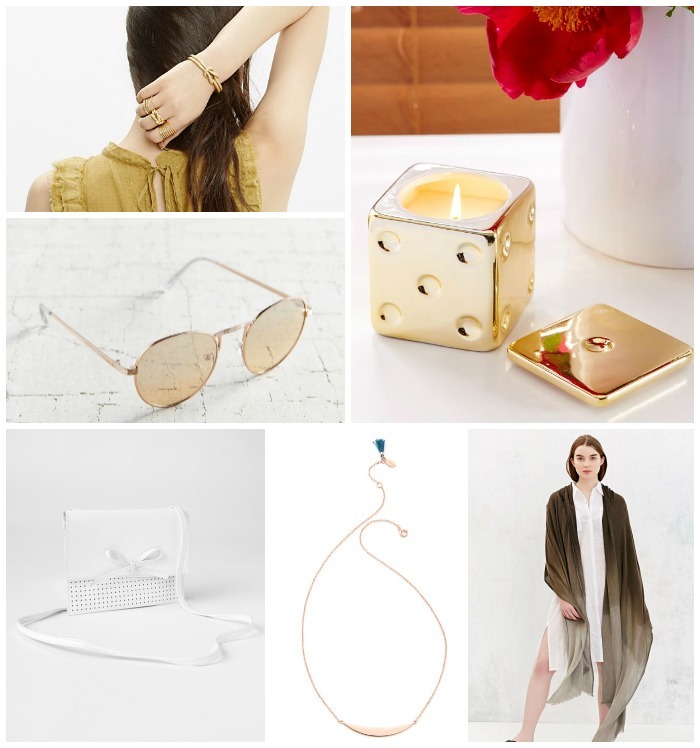 Add the rose gold Half Moon necklace to her jewelry collection. Is it bad that I have so many cross stitch ideas for this adorable Leather Perforated Crossbody Bag? 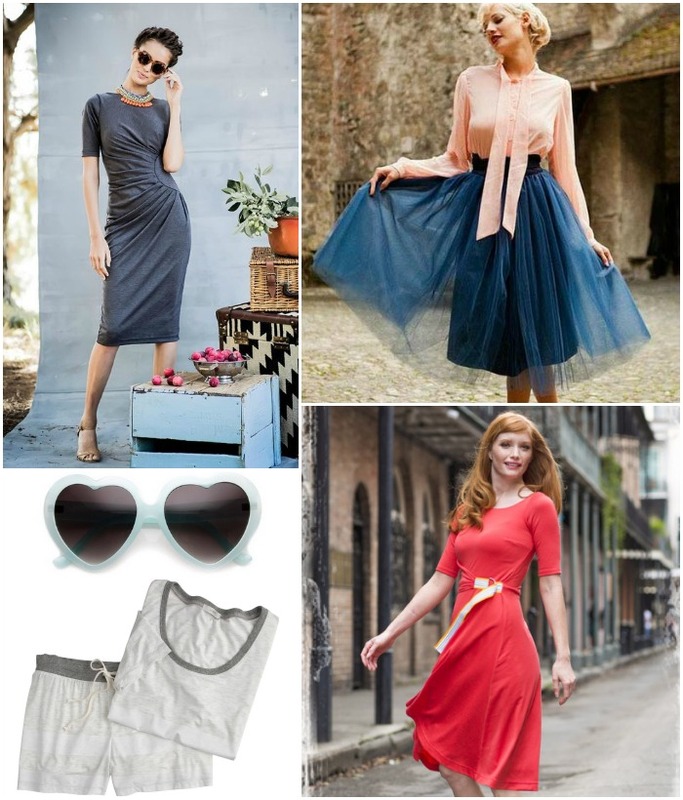 Show off your style with the Shabby Apple jersey knit Tea Time and Real Beaut Dresses. They are machine washable and perfect for the playground, coffee date, or the elusive date night. It’s Mom’s turn to feel like a princess with a grown up tutu of her own. Dress it up with jewels or dress it down with a denim shirt. It’s sure to turn heads, especially that little one watching you put on your lipstick. You may have seen on Facebook and Instagram (@prudentjacinda) that Jacinda got her hands on a pair of the cutest Pastel Heart Shaped Sunglasses. They are one of those go-to accessories you can always feel great in. I asked a friend of mine what she wanted most for Mother’s Day, a nap was her response and I think this soft Jersey Sleep Set will top that off quite nicely. Flower photo from top collage from Magnolia Rouge.